Weight at Rescue: 25 lbs. We heard about Kiro through some friends and went to see him for the first time when he was just 2 1/2 months old. We couldn’t believe what we saw: a cougar chained to a post; left over food parts bulging from the older tigers’ enclosures and drinking water containers that hadn’t been cleaned in weeks. 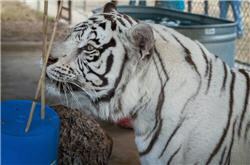 Kiro, like most of the cats from this facility, was bred so that he could generate money for his owners. 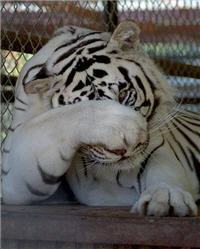 People would pay good money to own a white tiger or to have their picture taken with one. Before we could bring Kiro home with us, we had to first make sure that we could provide the things he would need for the rest of his life. In our search we found supporters that are still with us today. Kiro suffered from giardia, a bacteria from contaminated food or water. He also had a severe case of worms that caused his belly to pooch. 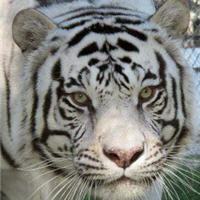 His color comes from a mutated gene found in Bengal tigers, although all white tigers in captivity in the US are a cross between Bengal and another subspecies, usually Siberian. 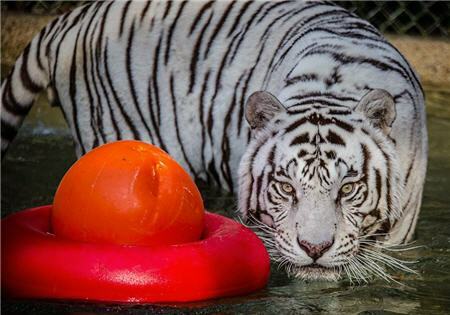 Kiro loves to play in his pool or tub, and his favorite toys are large barrels and big Safari balls.